Well, there’s a big gap between the nostalgic memories I have of watching The Flintstones on weekend mornings full of ads, and sitting down to watch a clean, uninterrupted episode with opening teasers and my awareness of the humour as an adult. 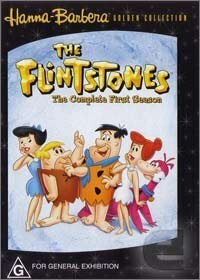 The phrase “modern stone-age family” is only really understood by watching a good few eps from the first season (1960). You have to dismiss any presumptions of realism. They’re a 1960s American family with caves and dinosaurs only as incidental backdrops. It is actually a bit of a timewarp to look back from 2006 and see their world. I had never realised how much The Simpsons owes to this Hanna-Barbera show. The more you watch the big, silly but ultimately adorable Fred, the more he starts to look—and sound—like Homer Simpson. The lovely neighbourly adventures between the Flintstones and Rubbles made me envious—I have no idea who any of the neighbours in my big Sydney apartment building are, nor am I likely to speak to them let alone become best of friends. There are various criticisms one could make of the show: it is patriarchal, it is suburban, it is consumerist, etc etc. I say ‘pish posh’—it is entertaining! For example, the second episode ever (s1e2 “Hot lips Hannigan”) features a “modern stone-age” rendition of the Beatniks and their ‘oh-so-cool’ goatees and skivvies. This is hugely funny. I recommend that if you do buy this collection, make sure you watch it with a group of people. The show still works in our time. The sound is quite good on the release, but what I like best about cartoons is that their visual quality and crispness does not age so the video transfer is great to look at. There aren’t any special features but it does come in Italian, Spanish and French audio and subtitles.